Sadly outgrown this stunning Gavin Doherty dress. DD has gotten many compliments at numerous Feiseanna. 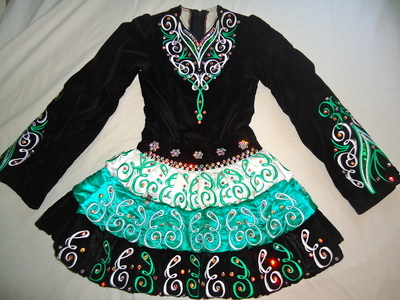 It is made of a rich black velvet bodice, with a layered, slightly puffball skirt. Covered in AA40 Swarovski crystals. Very effective on stage. Green underskirt with 2 pair of bloomers and a headband to match. Some room for alterations. Asking Price: $US900. Shipping costs are not included in the asking price. Returns are negotiable.